*This Kodi post is aimed at Windows users! Let us know if you would like one for a different Operating System. YES! You read this right! We are big advocates of Kodi and its capabilities. If you read our last post (here), we’re sure by now you are aware that you do not need to spend ££££ on a fancy computer in order to be able to set up a home cinema. You don’t even need to be a skillful Linux sys admin to be able to get this up and working. There are many ways to do this, but the final outcome should be the same. Please, let us know if you need further guidance and/or you experience any issues. *NOOBS = New Out Of Box System – this is a pre-purchased macroSD card that comes with some OS options pre-installed! Please note: the below guide assumes you already have the above prerequisites in your possession. These are not too different from each other, the main difference being that OSMC will give you access to a full-blown Debian-based OS while the other two are locked down in order to avoid self-inflicted issues. Use the links above to get to the official site of each OS and download a copy. One exception is that if you choose to install OSMC, you will have to download the installer for the computer you are using right now and not the Raspberry Pi. We know you’re impatient to get the Raspberry Pi plugged in to the TV and enjoy your entertainment! Sorry to disappoint you – you will have to wait another few minutes. Without further ado, roll up your sleeves and let’s get started! IF YOU HAVE A macroSD card reader, you can skip this section! Insert the macroSD card into the SD card converter. Once it is in there, make sure that the small physical slider on the side is all the way up at the top. This ensures that the card is not write-protected. Each of the above OS’s will come with instructions on how to install the image to the macroSD card, Most of the common instructions include unzipping the files of the downloaded file straight to the macroSD card. You can also use a program, such as Etcher or Rufus to create a bootable macroSD card. Connect all the cables – HDMI to the Raspberry Pi and to the TV or monitor that you will be using; power adapter to the Raspberry Pi. Once you are at the home screen, you should be able to use the attached USB mouse and/or keyboard in order to click on Videos. When you are at the Videos screen, you can add a new location on your Home Network that contains all of your videos. We recommend that you add your TV Series separately, under the appropriate screen. There are a few ways to do this – when you click on “Add Files”, you can click on Browse and locate the folders on your network; you can the Samba protocol, if you have a Samba-enabled device. For more in-depth information, you can always refer to the official Kodi Wiki. 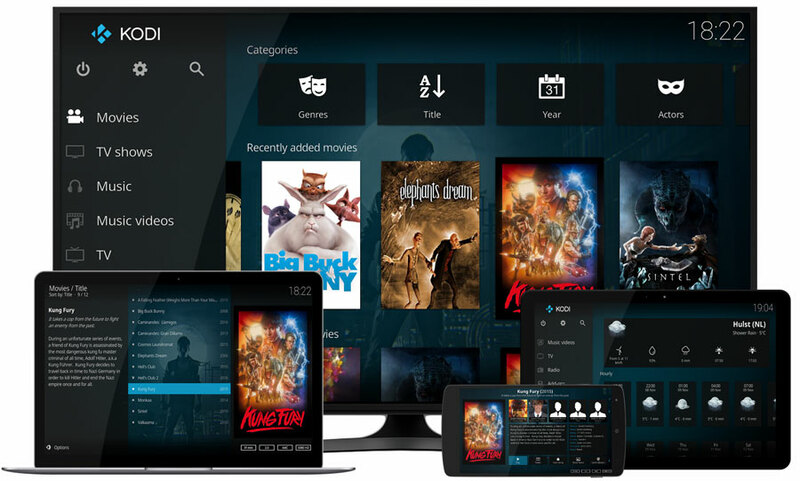 Download the Official Kodi Remote App for your smartphone – if you choose to do this, you will have to make sure that port 22 (SSH) is enabled within your Kodi setup. This can be done through Settings > System. Use your TV Remote control with Kodi – not all TV remotes are capable of doing this. Some of the newer ones, however, should be able to control the Rasperry Pi device and you will not need to download any additional software. Install Kodi on your Windows PC – if you already have a gaming platform or a home cinema computer, you can download and install Kodi on it. Alternatively, you may want to separate Kodi, by running it within a virtual machine that is running on your computer/laptop. Order a NOOBS card with your RP – some websites offer the option to buy a macroSD card that has a bunch of OS’s already installed on it. This way you will save time when it comes to setting up your device. We would advise that you back this card up before you make any further changes! In the next part, we’ll explain how to install some of the most famous addons for Kodi, stay tuned! We aim to provide you with easy-to-understand, interesting posts, at the same time covering any little caveats that might catch you out. Feel free to reach out to us if you need more information or would like to leave us some feedback! « Raspberry Pi for one, please!